Summer is alive and well in Indiana, and the pubs are opening their outdoor patios to invite Hoosiers and guests alike to enjoy traditional pub favorites, great drinks, and a wonderful night out with friends and family. Come find your next pub favorite today! Claddagh Irish Pub has been in the downtown Indianapolis area since 2000 and has a passion for the past and hope for the future. They are 100 percent smoke free and family accessible every day of the week. They are located in the historic Wholesale District, and in the heart of the Irish community in Indianapolis. The first Saturday of the month features live, traditional Irish music and on the weekends, a live DJ. Try a traditional Irish mule or the Guinness Bloody Mary with one of the restaurant’s traditional Claddagh boards – sausage, hummus, or cheese. Rookies Sports Pub is another great place in Lafayette featuring good food, drinks, and a friendly environment. Come on Wednesdays and enjoy Brain Blast Trivia Night, or on the weekends to enjoy live music. Enjoy a basket of crispy, crunchy potato wedges or the hand-breaded chicken tenders, made fresh with each order. The pub also features great pizza, delicious hamburgers, and an impressive selection of beer and liquor. Broad Ripple is the most popular area of Indianapolis to visit, so it seems fitting that when in Broad Ripple, you do as they do and visit the Broad Ripple Brew Pub. The Brew Pub was established in the late 1990s and is the oldest operating brewery in the state. Its design features a recreated English pub atmosphere, courtesy of owner and Englishman John Hill. Dark wood paneling, tin ceilings, and a cozy fireplace with one of the largest outdoor cafes. Guests will find lively conversation, a family friendly atmosphere, handcraft beer, and they are also dog friendly. The pub features a variety of delicious beers on tap and a large menu with so many mouth-watering options to choose from! Great food and great times is what it’s all about at Holly’s Restaurant and Pub in northern Michigan City, Indiana. You’ll find a friendly welcome, amazing food and excellent customer service. Holly’s serves traditional American cuisine, as well as select Mexican dishes and the best slow-cooked barbecue. Holly’s Pub has been in business since the mid 1970s and is the favorite choice for casual family dining. Try a basket of Holly’s Sassy Wings or the Holly-American Burger. Trubble Brewing is located in northwestern Fort Wayne, Indiana, and features a beautiful, spacious outdoor patio, open to guests of all ages as long as they are accompanied by adults. The indoor scene is strictly for those 21 and over and is the best pub in Indiana to take your furry four-legged friends. Trubble features house-made dog treats that Fido and his best friends can’t get enough of, water bowls and comfy doggy beds on the patio. All of their human food is locally sourced, fresh and features zero processed ingredients. Their most popular menu item is their Ramen Noodle Night every Thursday and features a different protein every week. Great beer is what The Tap in southern Bloomington, Indiana, is known for. With a brewery on site, they offer 20 original beers on tap to choose from. They also have over 400 bottled beers to choose from, and a wide variety of scrumptious pub food items to choose from. Most popular are the Tap Fries that come with four different dipping sauces, and the Angus Sliders with melted brie cheese and bacon jam. Throughout the week visitors will also find live music and flat screen TVs to see what’s happening in the world of sports. The best Irish pub in northwest Indiana! Matey’s has been serving the Crown Point area since 2009, specializing in traditional Irish food and homemade comfort food. The restaurant features a full bar and restaurant, live entertainment, games, and more! 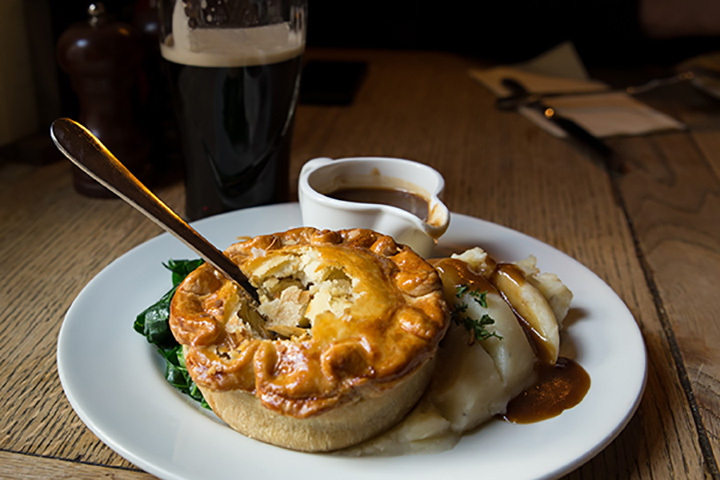 Enjoy traditional pub food such as the ever popular mozzarella sticks, corned beef, bangers and mash, shepherds’ pie and traditional fish and chips. The motto of Hunters Pub in West Lafayette is “you’ll never drink alone!” This neighborhood pub features great food and friendly service, an extensive beer list of imported and domestic beers, an award-winning menu and plenty of HD TVs to watch the games. Popular selections include Hunter’s Deadly Sins, or all the delicious drinks and specialty beverages such as a Chocolatini, Keoke Coffee, Winter Witch, and the infamous Boilermaker. Their most popular menu items include the buttermilk breaded popcorn shrimp, beer battered onion rings and the Hunter burger. Guests of Bloomers Pub and Eatery will find locally sourced food at a reasonable price, a great atmosphere, and friendly prompt service. Bloomers partners with many local businesses to use fresh, quality ingredients in each of their menu items. Favorites include Indiana’s very own original Pork Tenderloin sandwich, Bloomers Melt, Whatcha Wantin’, and their wide selection of baskets. The Exchange Pub and Kitchen is housed in a historic, 1800s-era Italianate style building and features a warm, casual neighborhood atmosphere. Inside guests will find an indoor/outdoor courtyard and patio bar, and a season menu from Executive Chef Joseph Horneman, which features locally sourced products and made from scratch items. The highlight of the bar is the American craft breweries with 12 rotating draught selections and 12 by the bottle options, cocktails made with house-made syrups, bitters and premium spirits. They also have a great selection of red, white and sparkling wines, and their most popular menu items include beer cheese and habanero and coconut mussels.